Bryston sure has been spreading its metaphorical wings as of late. Beginning with an ambitious foray into the world of loudspeakers in 2012, the company has continued to broaden its offerings, most recently with the surprising release of a turntable driven by an innovative power supply, a range of modular phono amplification products, the next-generation “cubed” series of power amplifiers, and the delightfully unexpected announcement of a new CD player. This expansion effort is further exemplified by developments within the company’s product lines. The Bryston BDA-3 DAC enhances the functionality of the 2013 Product of the Year Award-winning BDA-2 by adding a second asynchronous USB input and four HDMI inputs. PCM sample rates up to 384kHz are now supported, as are DSD rates up to DSD 4x (aka DSD256). Most significantly, not only can DSD signals be received by the BDA-3’s USB inputs but also from suitably equipped HDMI sources. In light of the questionable ongoing availability of premium SACD players—and the finite lifespan of any optical-disc transport mechanism—this ability to play SACDs in native DSD mode over HDMI from inexpensive universal-disc players adds a capability heretofore unavailable from high-performance stereo DACs. 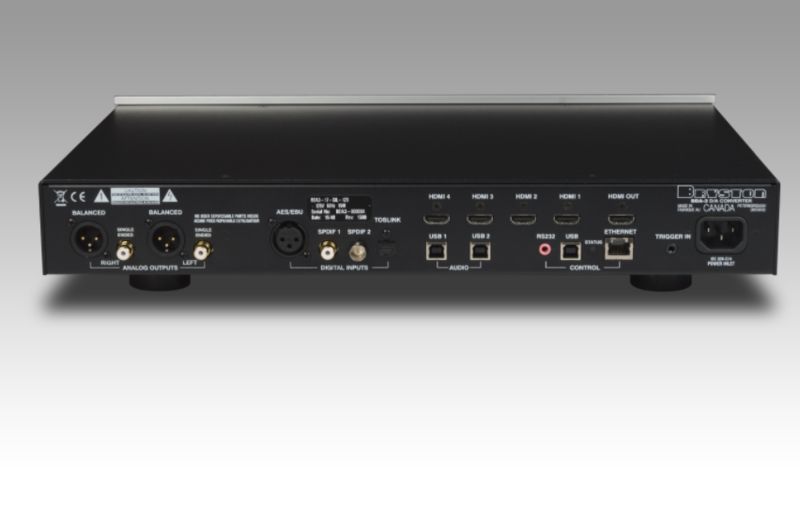 Traditional digital sources are accommodated by one AES/EBU balanced XLR input and three SPDIF inputs, one for each connectivity variant: 75-ohm coaxial BNC, coaxial RCA, and optical TosLink. Performance is elevated by a pair of AKM Verita series D/A converters, configured in dual-differential mode to optimally drive Bryston’s discrete Class A balanced output stage. (Both single-ended RCA and balanced XLR outputs are provided.) Three of the HDMI inputs support HDMI v1.4a and HDCP 2.0, while the fourth HDMI input is compliant with HDCP 2.2 sources. Conveniently, the last-selected HDMI input’s video signal continues to be passed through the BDA-3’s HDMI output even after a different non-HDMI input has been selected. The addition of DSD support to the USB and HDMI inputs necessitated one change from the BDA-2: The user-switchable synchronous upsampling feature (to 176.4kHz from 44.1 and 88.2kHz signals, or to 192kHz from 48 and 96kHz signals) now functions only on the AES/EBU and SPDIF inputs. Bryston’s optional BR2 system remote control has not yet been updated to enable selection of either the second USB input or the four HDMI inputs, but codes to program universal remote-control handsets are provided in the manual. In addition to Bryston’s typical comprehensive support for a variety of custom-install protocols, the BDA-3’s Ethernet port and DHCP client enable access via a web browser when connected to your network. The straightforward browser-accessed user interface not only enables firmware updates, but also visually replicates the front panel LED and switch array, allowing selection of every input, and displaying sample rate and signal-lock status. In a clever touch, the web interface of Bryston’s BDP series of music players automatically detects a networked BDA-3 and displays a convenient link to the DAC on the BDP home page. I began assessment of the BDA-3 by comparing it against the BDA-2, which has served as my reference ever since my review in Issue 233. With either the Bryston BDP-1 or BDP-2 file player as the digital source, the BDA-3 immediately drew my attention to the vibrating resonance of the bodies of acoustic string instruments, each note blooming richly and decaying naturally into the surrounding air. Everything played through the BDA-3 came across with a lithe ease, even-tempered and well balanced. Harmonics extended into the upper octaves with a relaxed open airiness, refreshingly free of shrillness. This exceptional verisimilitude allows the distinctive character of specific instruments to be discerned with considerably less mental effort than is often the case, nowhere more aptly demonstrated than by the measured, slowly awakening “Dawn” dialogue between Simon Shaheen’s oud and V.M. Bhatt’s mohan vina (Saltanah, Water Lily Acoustics 24/88.2 download). I’ve heard this performance hundreds of times, through all manner of equipment, but the BDA-3 enabled me to follow the intentionality of the two masters’ playing as never before—making their performances engrossing from shadowed beginning to radiant ending. As I continued comparing the BDA-3 and BDA-2 with familiar recordings, it became clear that the newer design rendered instrumental timbres with more substantive physical presence. Every instrument simply exhibited fuller, weightier solidity, independent of the frequency range covered. I suspect that this fundamental shift in tonal perspective may be due to a change in the type of digital filter that Bryston has chosen for the BDA-3 relative to the company’s prior digital offerings. This advancement manifested itself spatially, as well, with instruments and singers more fleshed-out both tonally and dimensionally. One of the most enlightening aspects of following the writings of this journal’s founder Harry Pearson was the evolving sense of discovery, and of the sometimes difficult task of trying to find the right words to describe what we hear. I readily empathize, as I find myself struggling to convey my most salient impression of the Bryston BDA-3. It did not take long to ascertain that listening through the BDA-3 was simply more evocative of the experience of hearing the real thing, significantly less impaired by the host of digital artifacts that often remind us that we are listening to a reproduction, rather than to live music. As I have come to expect from Bryston DACs, the BDA-3 was reliably consistent regardless of the digital input format. Differences between sources and cables were readily apparent, whether via SPDIF, AES/EBU, USB, or HDMI; this enables the user to choose the best-sounding connectivity option from each source component, and remain confident that the BDA-3 will not constrain its performance.